Sigara dorsalis is a widespread and common species which occurs in a range of habitats. The bug is often found in reed-beds bordering lakes and ponds, with a preference for a neutral to alkaline pH, little, if any, pollution and low amounts of organic matter (dead leaves etc). It is one one of relatively few species of Corixidae that occurs in flowing water and is commonly encountered in canals, ditches and slow flowing rivers. Sigara dorsalis readily flies, although not over great distances, and is often caught at light traps. The bug feeds on detritus, algae and small invertebrates. Like most corixids, adults overwinter and reproduce in the spring. In the case of S. dorsalis a new generation of adults appears by July which gives rise to a second generation that overwinters. Males produce mating calls, which are loud enough to be heard above the water surface, by rubbing the foreleg femora over the maxillary palps (mouth parts), (Jansson 1979). Receptive females respond to the calls prior to mating. The map is based on records from NBN Gateway, with yellow dots showing pre 1990 records, reds dots 1990 – 2015 records and red on yellow dots overlapping records. 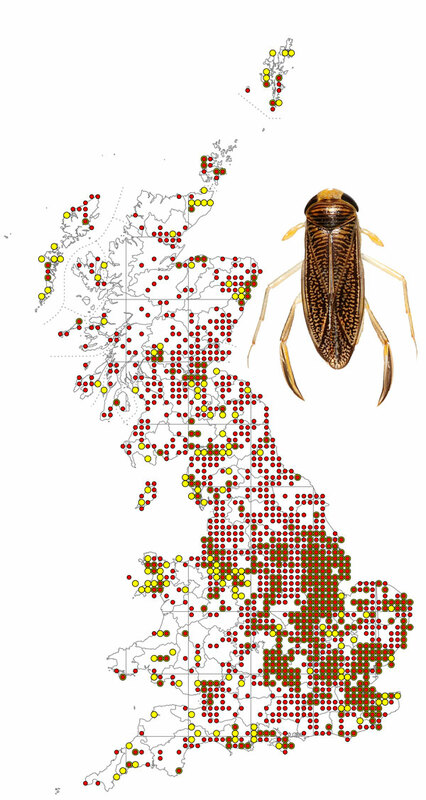 Sigara dorsalis occurs throughout the UK, although rarely above an altitude of 300m. The species occurs throughout most of Ireland. Although many species of Sigara may look similar at first glance, a combination of the following characters will generally be sufficient for identification: the length, the number of pale lines on the pronotum (and sometimes the shape of the pronotum) the pattern of dark and light lines on the forewing, the structure of the male pala (see below) and the shape of the metasternal xiphus (see below). Sigara dorsalis is one of the larger Sigara species (length >6.8 mm), it has 6 pale lines on the pronotum, pale lines on anterior part of the clavus that are much wider than the alternating black lines, two rows of pegs on the male pala and a metasternal xiphus that is no longer than its breadth at the base.